Mexican tiles in "Campeche" style. 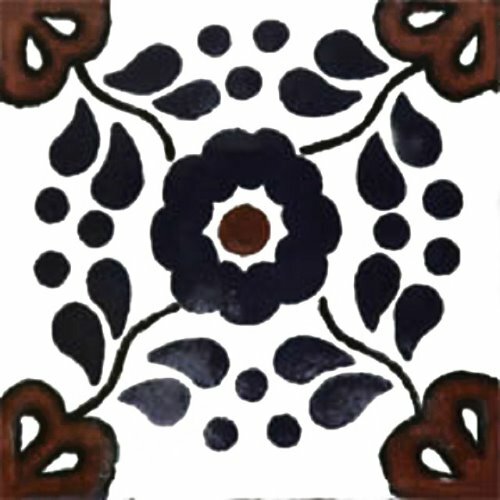 Handmade with dark blue, black and terra cotta red clay tile design over white background. Shipping from Mexico to the US and Canada is estimated for four weeks. Great classic colonial pattern, it was what I needed. The only problem I had it was the color. On the product page image it looks like black, I am talking about the elements at the tile center. In reality, it was dark blue kind of cobalt or navy blue. When I send a message after receiving my tiles from Mexico they replied that some computer screens may display colors differently. Still, they mentioned black in the description but it was related to the tile design outlines and not the pattern. Well, I am satisfied with my purchase and can live with it even though it is not exactly what I expected.